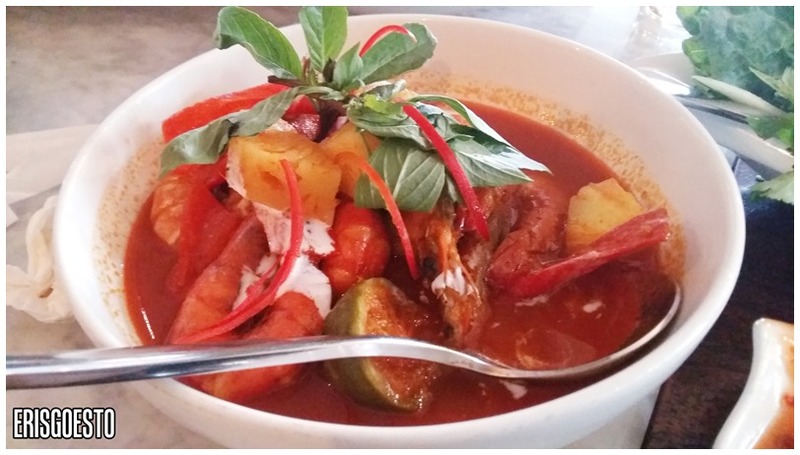 It’s hard to pinpoint a particular style of cooking at Mamasan, since their dishes are so diverse – with Indonesian, Malay, Thai, Vietnamese, Indian and Chinese influences. Me, I prefer calling it Awesome Asian Food. The Bali-based restaurant, helmed by award winning chef Will Meyrick, has done so well that they’ve opened a branch in Hong Kong, and one in Kuala Lumpur in 2015. Good news for us Malaysian folks. 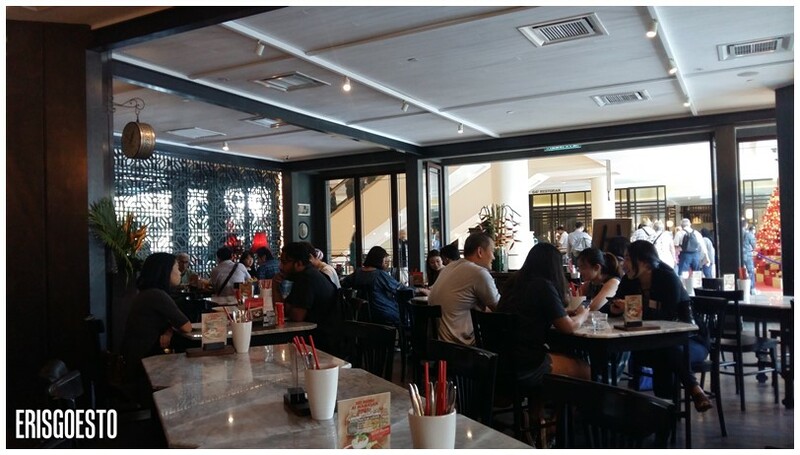 Located at the base of Suria KLCC, the chic eatery has nice outdoor views of KLCC Park. 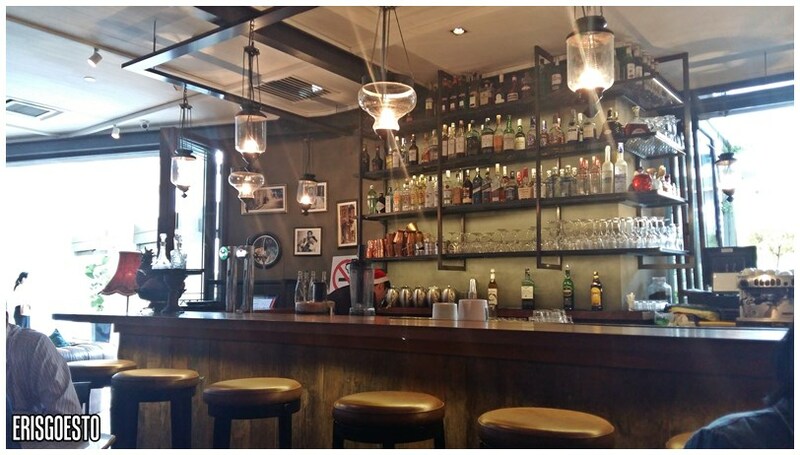 with The inside sports a fully stocked bar, cosy corners decorated with art pieces, and wooden tables with marble tops. 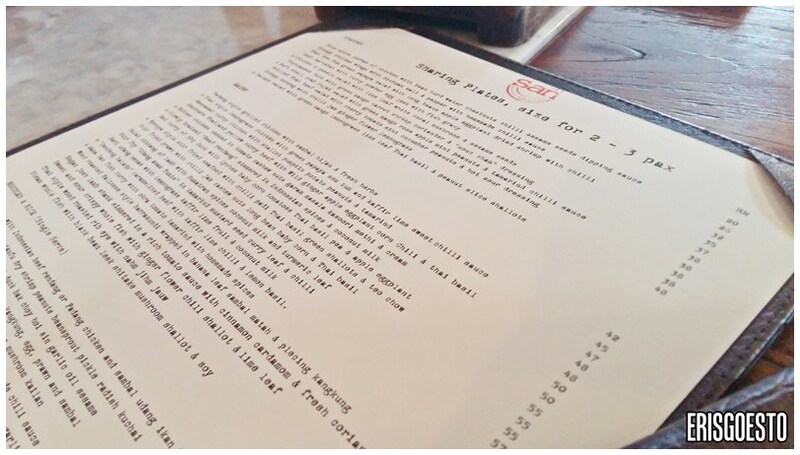 The menu is all on one page, but I think the design needs some working on. Font was so tiny we had to strain to look at the words. Since this is KLCC, expect to pay higher prices: about RM40+ onwards for mains, and Rm20+ for appetisers. 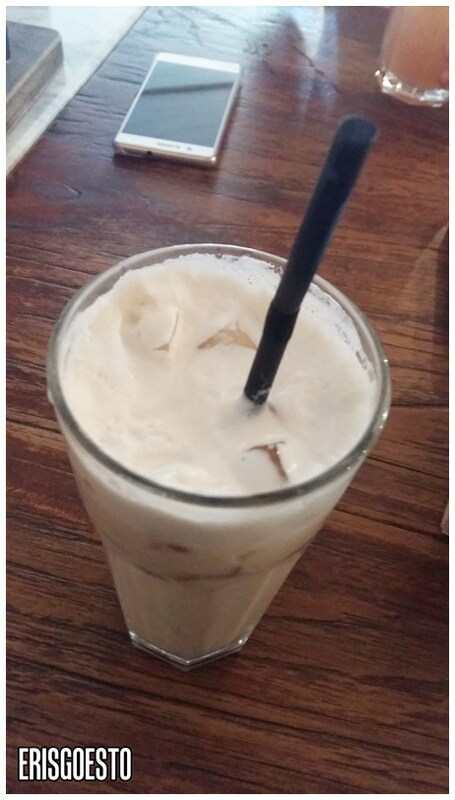 Iced Chai Tea was spicy and frothy, with a hint of condensed milk. 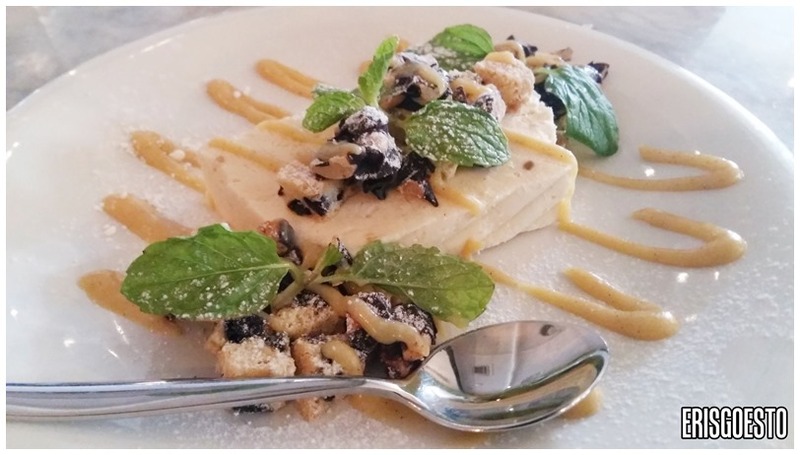 Sweet and creamy but not cloying. Since I was here with my colleagues for Christmas lunch, we had loads of food. 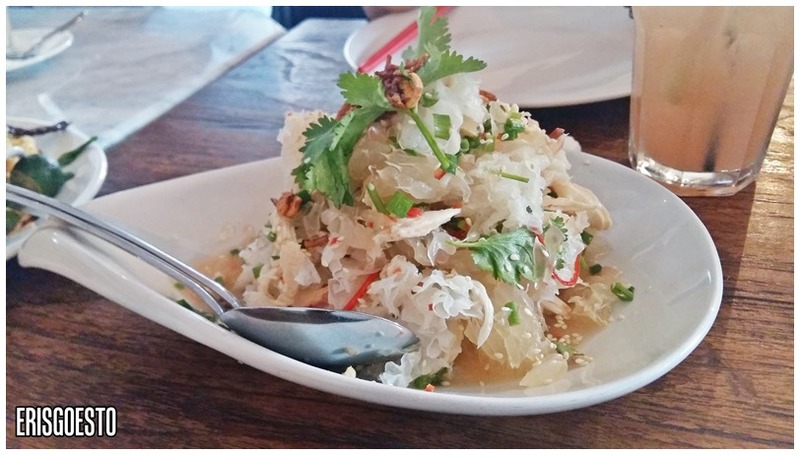 To start off, we got the chicken and pomelo salad with lime leaf, white coral mushrooms and sesame seeds. The pomelo was sweet and refreshing with a hint of tartness, while the white coral mushrooms had a crunchy, almost fungus-like texture. Tender chicken strips soaked the sauces up well for a salad that is good enough to eat on its own. Grilled Thai beef salad with cherry tomato, mint, cucumber, peanuts and hot sour dressing was a complex blend of flavours and textures; alas, the beef was a little overcooked and tough to chew. 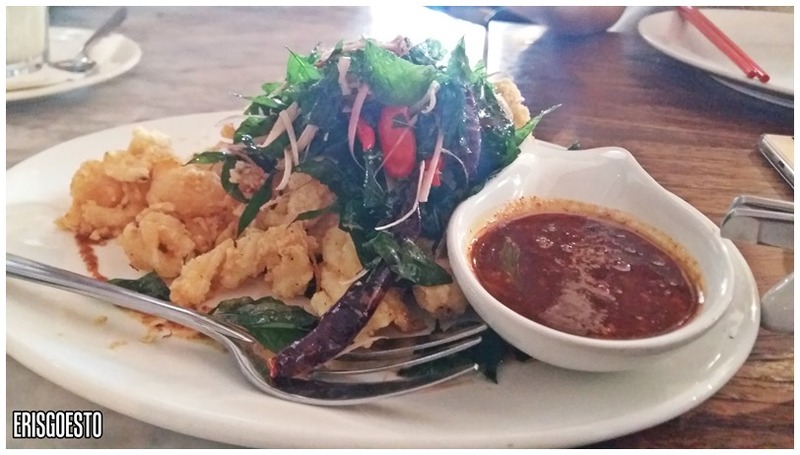 One of the best starters of the afternoon was the Crispy Sotong (squid) with chilli jam ginger flower lemongrass. 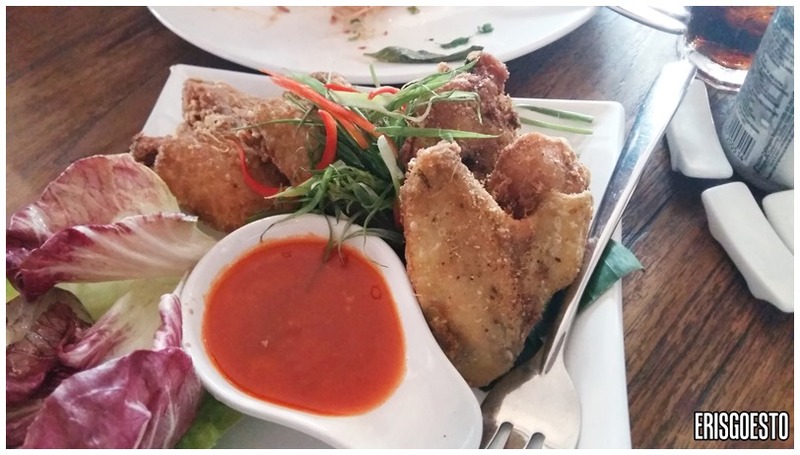 The seafood was springy and succulent, perfectly battered in flour, while the spicy chilli jam gave it an extra kick. Curry leaves added an extra layer of fragrance. Fried chicken wings with chilli sauce. This was a hit and miss – while crispy on the outside, the chicken felt ‘mushy’, like it had been frozen for too long. The Nyonya-style stir fried seafood with cili padi, Thai basil, green shallots and teo chew brought back familiar childhood flavours. 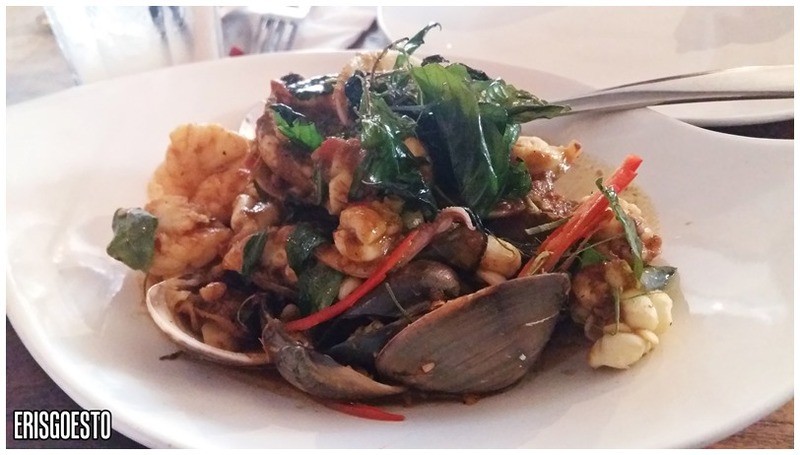 Served with a generous portion of springy squid and fat clams, the spicy sauce was a perfect accompaniment to rice. 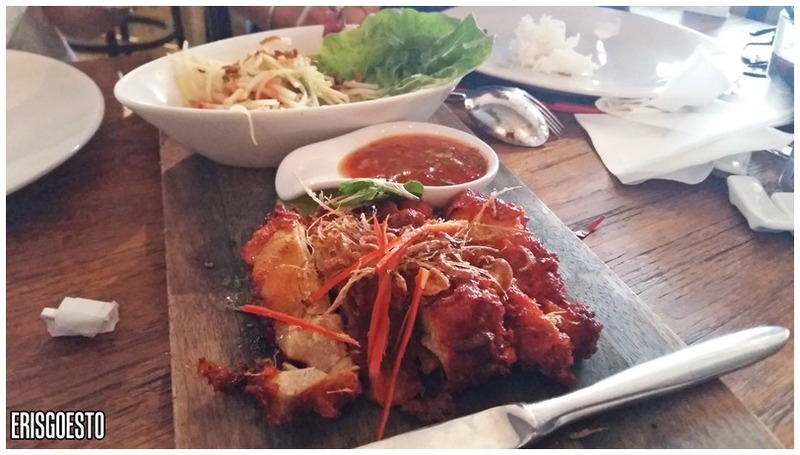 Thai style lemongrass chicken with green papaya som tum and kaffir sweet lime chilli sauce came presented on a wooden board. The crisp chicken, marinated with herbs and spices, was juicy and tender on the inside. 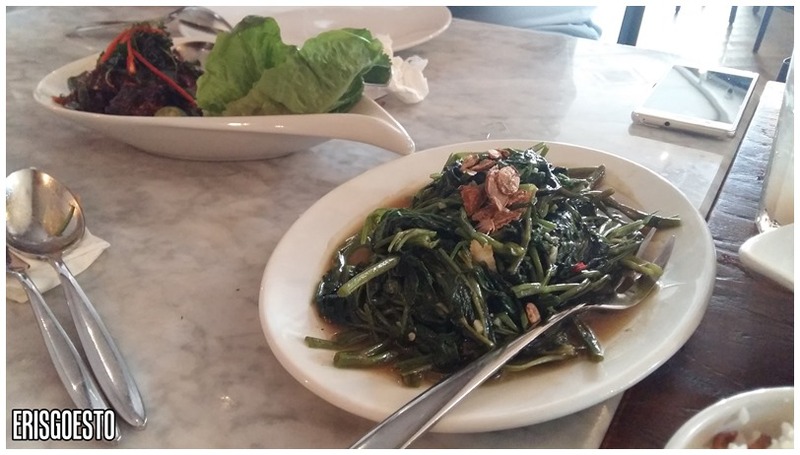 Stir fried water spinach (kangkung). 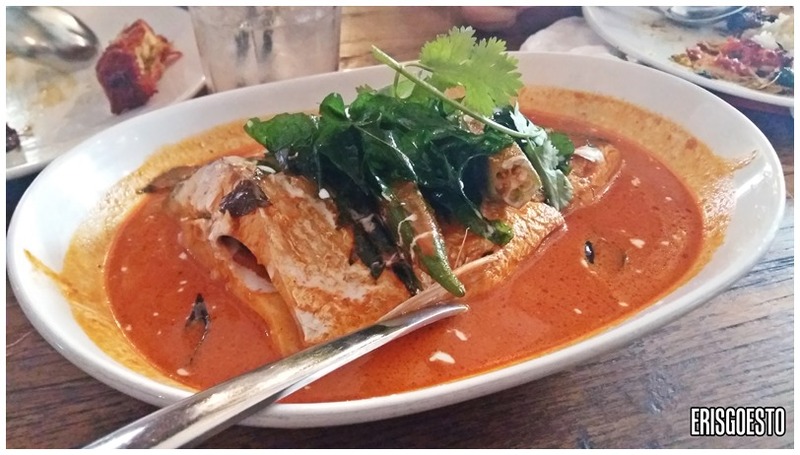 At this point we were vaguely aware that we might have over-ordered for the 9 of us, but the signature Mama San Fish Curry with okra, tamarind and fish curry powder was so good we finished it all the same. The sauce was creamy, spicy and sour from the tamarind, so more rice was in order. Final main of the day was Kari Udang Nenas with Lemongrass, Kaffir Lime fruit and coconut milk, served with sweet chunks of pineapple. It was rather disappointing despite the shrimp’s large size – like the fried chicken wings earlier, it had a mushy texture, like it had been frozen for some time. 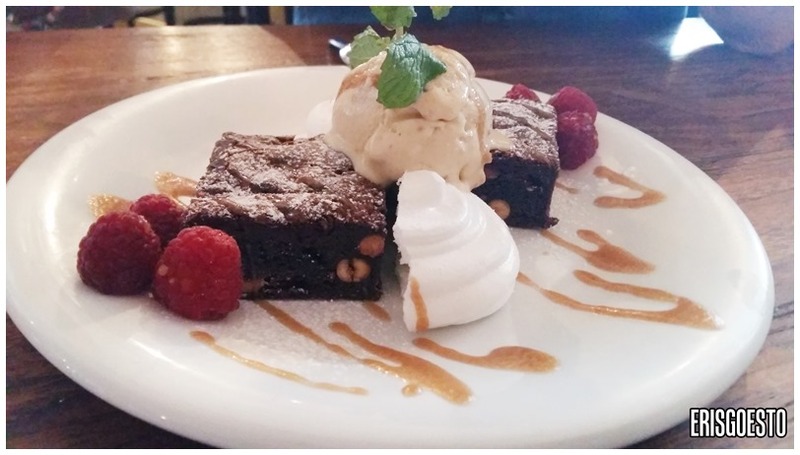 Always room for dessert! Crumble chocolate fudge cake with peanut butter ice cream caramelised sauce was served with meringue, raspberries and a dusting of sugar. Wasn’t the best, as the cake was too sweet/solid and the meringue was too hard. Colleagues left this unfinished. I shared this with another colleague – Kampung Snicker peanut butter parfait with butterscotch and chocolate coated peanut. This, at least, didn’t disappoint. The parfait had the right consistency and melted right in the mouth, while the chocolate peanuts lent the dish elements of crunchiness. G46, Suria KLCC, Kuala Lumpur.